“One of the most widely printed and quoted statements of business ethics in the world is the Rotary "4-Way Test." It was created by Rotarian Herbert J. Taylor in 1932 when he was asked to take charge of the Chicago based Club Aluminium Company, which was facing bankruptcy. Taylor looked for a way to save the struggling company mired in depression-caused financial difficulties. He drew up a 24-word code of ethics for all employees to follow in their business and professional lives. The 4-Way Test became the guide for sales, production, advertising and all relations with dealers and customers, and the survival of the company was credited to this simple philosophy. Herb Taylor became president of Rotary International during 1954-55. 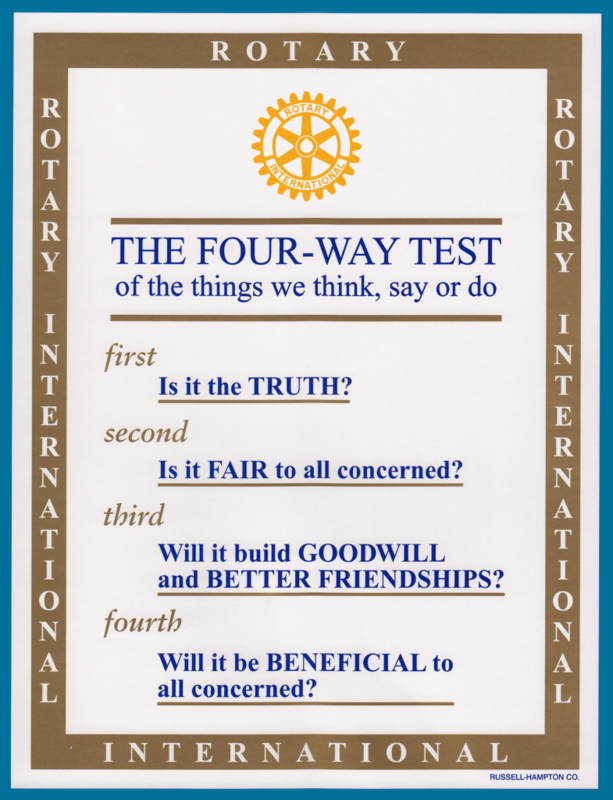 The 4-Way Test was adopted by Rotary in 1943 and has been translated into more than 100 languages and published in thousands of ways.